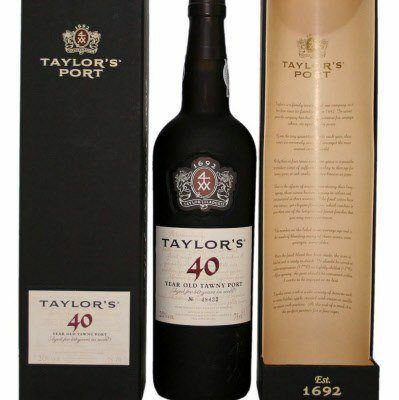 Taylors 40 year old Tawny Port wine 70cl for a 40th birthday gift idea for this gift we can add a Birthday card or Anniversary card, the gift boxes are suitable for postage. 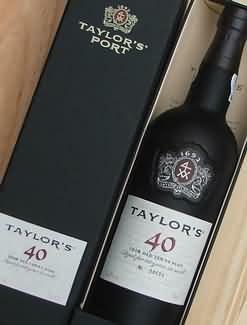 Taylors 40 year old tawny Port wine. Olive bronze in color, this is an exotic, intense old tawny with layers of penetrating aromas and flavors of caramel, burnt sugar, chocolate, toffee, nuts and toasted spice in a dense, luxuriantly textured palate which is underscored by a fine, elegant acidic backbone. A 40th birthday gift. A gift for an Anniversary or retirement. If this is special gift you can select the delivery date after you checkout. Tasted at Taylor’s tawny seminar in London. Pale mahogany core with a tawny rim. The nose has a generous, nutty bouquet with semblances towards a Bual that ebb with time. Very fine definition, the nose opening up with time with a touch of antique furniture shop, honey, juniper berries, dried apricot and sloe. The palate has a peppery entry with touches of soy and Chinese 5-spice, expanding nicely across the mouth but maintaining focus. Its judicious oxidative elements impart potent walnut, smoke and red pepper flavours towards the mellow, understated, sumptuous finish. Wonderful. Tasted October 2010. Made entirely from the grapes grown on Taylor’s own properties, Taylor’s is one of the few remaining houses which still produces a 40 Year Old Aged Tawny Port. Tiny quantities of this wine are made. Decades of evaporation and ageing in wood have concentrated this wine almost to an essence, producing intense and complex nutty and spicy aromas and a dense and concentrated palate full of rich mellow flavour. A sublime port of very great age which shows the old olive-gold hue of its many years in cask. Decades of evaporation have concentrated this extraordinary wine to an exceptional density, with a powerful nose of dried fruit, honey and a touch of spice. Impressions of nutmeg, roasted coffee and an intense nuttiness converge both in the bouquet and on the palate. The wine´s rich, intense, voluptuous, almost viscous texture culminate in a finish of incredible length.